The future of music education is here! Sign NOW up for the Spring Session by going here. Be in a jazz band! in the Long Beach, CA area. 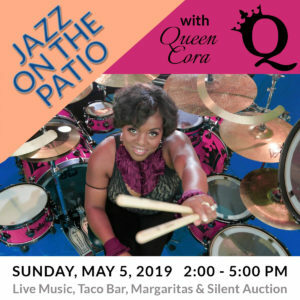 May 5th is our annual Jazz on the Patio, an incredible event. an inspiring, passionate and explosive international drummer. Come hear her play with our jazz musicians. The Jazz Angels were founded in 2007 by two professional musicians and teachers that recognized a need for a unique type of music education for young people. As they reflected on their own experiences and personal introductions to music, and considering the devastating decline of music education in schools, they developed a program to that gives wings to young musicians’ desires, and opportunities for today’s youth to experience and perpetuate America’s only original musical art form – jazz. On their own terms. Still today, the purpose is to create an opportunity for young people to hear and learn about jazz, encourage them to play an instrument, and provide opportunities for them to perform. A unique component to The Jazz Angels methodology is to engage professional musicians as mentors who play alongside the participants, providing inspiration and instilling pride and discipline. Our mission is to create an environment for playing and preserving jazz, and to empower young musicians to develop self-confidence, leadership and group interaction skills. Jazz Angels Vision: Our vision is to become the premier model for jazz preservation and education. Inspiring young musicians today, preserving jazz for tomorrow.